It's the little things that add up to the bigger picture ... and inspiration leads to recognition." My Grandmother once told me that I was afraid of recognition. Don't we always have to face what we most fear in ourselves... eventually? I usually start my paintings with an image that inspires me. Little did I know that this one would be one that was shared many times over and over and over. There. Recognition. I love wolves. I scour the internet for reference poses that I can draw from. My commercial art training leads me to seek balance in my designs and layouts. This picture of a wolf walking along a path appeared on Facebook. It seemed to me an auspicious sign. Like the wolf in the photo, I am on the move, wandering, wondering where the next piece of the puzzle will be revealed. I hear feedback. I hear people say, "that looks like Sonara's work". Recognition. At first this triggered discomfort within me. I was squirming and feeling guilty about using the image as part of my overall design theme. Too late now. I used this idea to illustrate my inspirational thought and find my way to some kind of understanding of myself and once again, the ability to recognize where I'm at in the moment. It think it was a setup to learn a few lessons with the help of the spirit wolves. The image stared back at me from my computer screen while I quickly sketched the wolf, the path and some trees in my chicken scratch style on my watercolor paper. I drew a large circle around it and the moon above for intuitive insights. Wolves are always associated with the moon, following their instincts and their nose. I followed mine. More wolf images were found and drawn onto the picture because their stances lent them to the overall image. Paw prints were added to the outer circle. These suddenly made sense! Don't we all have a tendency to go round in circles and get stuck in a rut of our own creation? At what point do we decide to do something different? Pathfinder; this was the theme... that first thought... the seed they planted in my mind. Then my Grandparents or my Spirit Guide or my Muse, whatever that guiding voice I frequently hear said clearly, "paint it and it will sell". I was headed for a shamanic conference with a wolf theme running in the background. That meant: I would sell this piece of art there, didn't it? For most of my life I have repeated certain patterns that made me feel as though I was just going round in circles over and over. I was stuck in a rut traveling the same well worn path of resistance. I wanted to break the cycle! I want things to make sense to me. I like structure and balance. I love symbolism and my work is full of many hidden and not so hidden meanings and of course, my lessons. So the central piece of the theme is about a wolf (me), trying to get back on track. What is my true path in life? What does it look like? Does this wolf travel alone? Where is the sense of pack? A sable wolf stands at the edge looking over her shoulder as if to say "When are you gonna pay attention? When are you going to decide to do something different? More specifically, when are you going to make time to paint?" So many questions! Yet ... meaning and answers to these questions always come to me after I finish a painting because when I do paint, I go into a zone; a meditative state so deep that I forget to eat and I completely lose track of time. When I am done, I can step back and see the messages in the painting. I think I found some answers here. I realized there is a paw print missing in the lower left corner and I thought "wow! the place of trust. 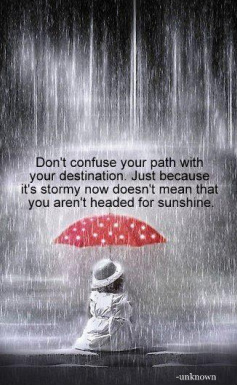 This is where I get off the circling merry-go-round and step onto my true path". I had managed to paint something. It became my marker; the time I chose to push myself to walk my talk and talk my walk. I have chosen a truly productive, fulfilling and recognizable path surrounded by wolves. Yes! I added two bars of color above and below for Mother Earth and Father sky to show that everything is connected in between. I have spent years seeking to bring teachings and aspects of my life into a cohesive whole and this image reflects back to me the idea that I have accomplished that goal to a certain extent. We as humans are all parts of a greater whole and our lives consist of parts and pieces that fit together constantly forming a bigger picture. 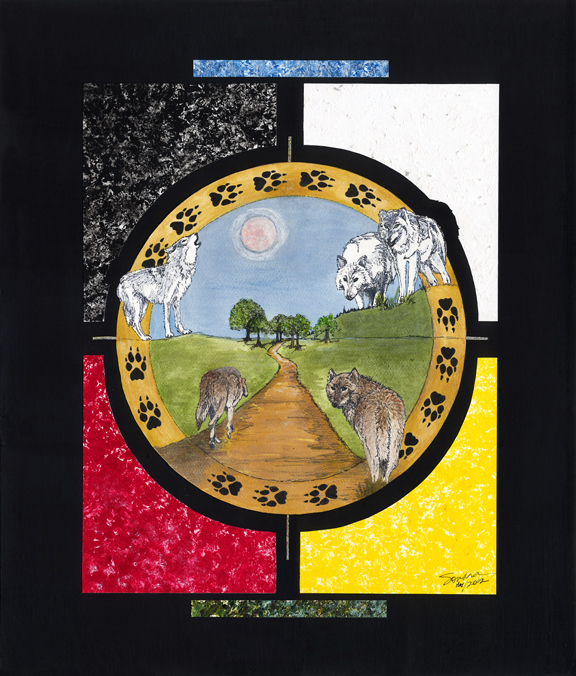 I have found a way to integrate my artistic talents with my love of wolves and my plan to build my life / my dream / my purpose: "ThunderWolf Medicine Lodge & Sanctuary". There are seven trees in the center that represent knowledge, roots and growth as well as the seven chakras in the body and the archetypal symbol, the Tree of Life or world axis. I share a teaching called Band Members based on comparing the human personality to animal or creature allies. An easy to grasp road map which enables understanding and clarity when one is reclaiming and learning about their true nature. The moon rise illuminates the path. It is about the time of twilight, one of the in between times of day when the veils to the spirit world are thin and intuitive information is more readily accessible. We should all listen to that small voice within, our gut instincts or our intuitive hunches more often. The white wolves watch from the world of spirit, guiding the seeker on his or her path. They are the wisdom keepers of this wolf medicine and teachings. listening is finally broken; it is replaced with a new pattern called "what's next?" and can now be established by a more direct approach. Animals have an amazing ability to focus on what they want or choose to study. They concentrate when they look at you and they wait. "Are you gonna feed me now? I'm waiting. Are we going yet? I'm ready. The other sable wolf standing on the edge of the circle also has questions for you, the viewer; "Are you ready to change your patterns and be true to your self? Where do you stand at this moment? Where do you really want to be? Come on, let's go... get on it." My intuition is always there to light my way just like my wolf companions who watch over me from the other side. My pack is always with me ready to reprimand or inspire, reminding me to walk my talk and create that which I most desire. They see the overall picture, the plan and the blueprint. I take the actions necessary to implement it. My hc wolfdog, Phoenix used to show me what a delight it was for her to run with me. Her ears would go back, her shoulders relaxed and the steady beats of my feet and her paws hitting the pavement set the pace for a light trance journey, a moving meditation. Our runs and walks together filled a primal need to migrate together as Pack. We became one, one fluid motion and I learned to listen with more than my body. For her, this was heaven on earth. Studying Wolf Medicine and having shared a part of my life with a real wolf forced me to put myself back on track. I love teaching and sharing the wisdom of the Wolf and I am humbly learning how to lead my human (community) pack. It is my time to see and be seen. Gotta get used to it, gotta love the recognition.